If you are a company in Silicon Valley or the San Francisco Bay area, you may have considered the possibility of implementing a last mile shuttle service to get your employees to work. Last mile shuttle service is a solution that meets your employees at the ferry, the nearest public transit stop, or the last drop-off point where they can’t get any closer to the office without walking. They board the last mile shuttle and ride in comfort to the workplace rather than arriving all hot and sweaty (or wet and soggy) after walking the remaining distance to the office. It’s a great concept, and more and more of the local area businesses are doing this. But how do you know if it’s for you? 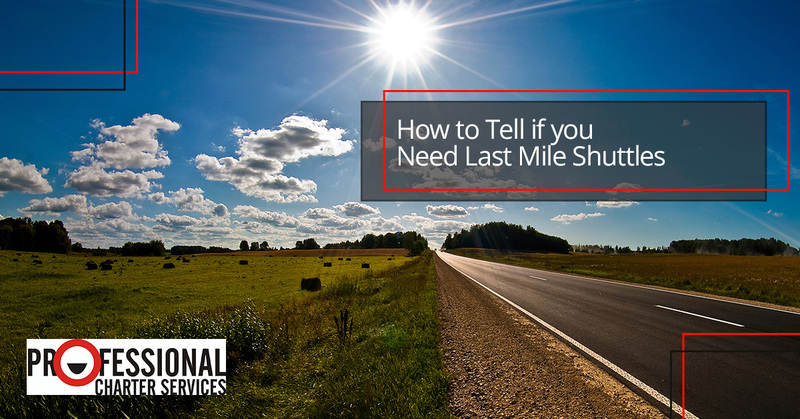 Here are some of the top ways that you can tell if you need a last mile shuttle provider. You don’t have to be a literal, 5280-foot mile away from the nearest transit stop for it to be a worthwhile thing to implement a last mile shuttle. Even a short distance of 200 yards from the nearest bus stop can be a 3-minute walk, which could be pretty uncomfortable in a downpour. Your employees will be grateful to trade their walk of any distance for a comfortable ride in an air-conditioned coach. If you notice that employees regularly show up at work in a Uber, Lyft, or other taxi—despite riding most of their way to work on public transportation—it’s a sure sign that a last mile shuttle would be a welcome solution. If people are overcoming the problem of getting to the office by paying for their own ride, that’s going to cost them a lot of extra money per month. In this economy, a last mile shuttle will be a sure-fire winner to delight your employees and put a few dollars back in their pockets. Not everyone is in perfect health. There is a large number of people who are well enough to work (and they have to keep working to provide for their livelihood) but their health presents a big challenge. If someone is struggling with physical issues, it will be difficult for them to walk even a short distance to work. Anyone who is fighting against fatigue, inflammation, or chronic pain will have a hard time navigating distances that are simple for some people, and the cost of their energy expenditure can take a toll on their productivity for the rest of the day. A last mile shuttle can save them from expending that energy on walking to the office after the last public transport stop, ensuring that they can offer more of their best work once the shift starts. If you want to attract top talent, you need to have extremely strong employee perks, and a last mile shuttle is one of these amazing offerings. Employees will see the last mile shuttle as a sign that you’re serious about their well-being, and they’ll appreciate the fact that you’re doing everything possible to facilitate their movements, rain or shine. A lot of the thriving companies here in the Silicon Valley are located outside the city limits of San Francisco, as there’s simply more opportunity for office space further away from the city. You have your office space in the suburbs, but your employees live downtown in the city (where they don’t use cars). They can easily get from their house to the nearest transit stop, because in San Francisco, the nearest transit stop is never very far away. However, public transit doesn’t serve all areas equally. They can’t easily get from the last transit stop to the office. There’s the problem. Even if they do have an available transfer that gets them closer to the office, waiting on that bus might eat up valuable time that adds a heavy burden to their daily commute. You make things faster, easier, and smoother for them when you simply pick them up in a shuttle and bring them the rest of the way to the office. We’ve already established that transit stops are numerous inside the city, but a last mile shuttle service can still be a valuable offering for the companies that are downtown. Whether your parking lot is far away, you have multiple people using the ferry and want to save them a transfer, or you simply want to streamline everyone’s day, a last mile shuttle can pick people up at all the different places where your employees are waiting and transport them safely to your doors. Some people ride the ferry to get to work. Some people take BART or the CalTrain. Others drive their own personal vehicles. Still others might ride a bicycle or use other ride-sharing alternatives. For the people who are on public transportation, ow do you coordinate all the ways that your employees might be arriving to work? Simple. You just look at what time your workday starts, what time the various ferries, buses, and trains will be arriving, and then send a shuttle to all of those different sites in order of arrival time. You can get way more complex and fancy and build an app and track passengers and so forth, but you don’t really need to. You just need your shuttle to be waiting when all the passengers spill out of the doors. Your employees will make a beeline for their shuttle, and they’ll ride to work in peace. Simple. Construction. Mechanical failure. Breakdowns. Delays. Overloaded infrastructure. If multiple failures of the public transportation system have caused your employees to arrive late to work, it’s not necessarily their fault. While most employees will plan some “buffer” time into their commute because of how unpredictable things can be, it’s not always possible to account for every contingency. The local public transit system is already at capacity, leading to a lot of headaches when something breaks down. Rather than having your employees wait for a bus that might be running late (and won’t even get them all the way to your office), why not simply pick them up at the closest transit stop and eliminate the guesswork? Implementing last mile shuttle service doesn’t have to be complicated. When you contract it out to Professional Charter Services, we’ll make sure that you’re well taken care of. We can help you think through the logistics of a last mile shuttle, ensure that it’s affordable, and design it to fit your best interests. Getting started is easy! Simply contact us and ask for a quote. We’ll be happy to help. Contact us today!